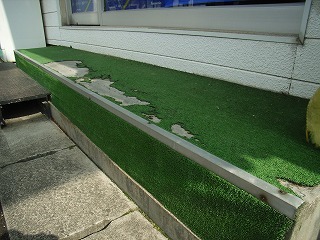 It hurts when about ten years pass, and it peels off and it has torn though astroturf (artificial turf) is pasted to the entrance of the shop. It was pasted to the floor with DIY. Astroturf and the material have been bought. 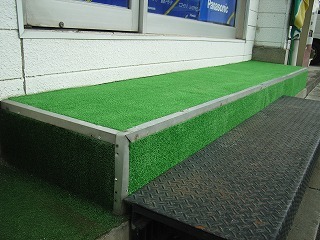 The thing of cut length (910X1800mm) green or type of the roll of astroturf is bought by thinking about how to paste it by measuring the place where astroturf is pasted in the do-it-yourself store beforehand. L type metal fittings made of aluminum and a plug and a stainless machine screw for the anchor are also necessary when there is a corner in respect and respect as showing in the photograph below. This photograph is astroturf pasted for myself about ten years ago. Astroturf has changed in quality because it is a place where direct sunshine strikes. First of all, old astroturf is peeled off. If metal fittings are taken and old astroturf is pulled, it is possible to peel off easily. Next, an old old adhesive tape for the adhesive and astroturf is removed. It is possible to remove with a scraper, and the adhesive and the adhesive tape stick hard and this might not be able to be taken when using it for a long time. For this case, the whetstone is shaved off to the disk grinder by installing it. Because the screw nail of iron that installed L type metal fittings made of aluminum (machine screw) rusted and I was not able to take it, this was shaved off by sander. Dust in respect of the groundwork and garbage are completely removed with the cleaner and the dustcloth. It causes to peel off after it pastes it when there are dust and garbage. It is very important. First of all, astroturf is set to the site and it cuts it. It paves on the site with scissors a little in the actual thing match completely and the sign is put. Astroturf is cut in the straight line with scissors by using the straight line parts of a long metallic measure or L type angle, etc. Next, surroundings of astroturf and a moderate interval are put and the adhesive tape for astroturf is pasted. The whole is pulled to astroturf to do wrinkle while suppressing it from the edge and it pastes it. Fit and pasting for the joint not to open and so as not to come in succession are the misoes. They are made to suppress on and to stick well when pasting it. L type metal fittings made of aluminum are installed in the part of corner. L type metal fittings made of aluminum are installed in the part in the corner (suspicion) in respect and respect as shown in the photograph above. The part in the corner is worn out at once if this is not, and the whole peels off. Externals look beautiful seem strong. When the groundwork is concrete, the method of installing L type metal fittings does as follows. After the hole in the under is made for concrete by the vibration drill etc. , and the anchor for concrete is driven, it tightens with a stainless machine screw.